As far as I can recall Lynchburg was just a normal, small town seemingly unaffected by the atrocities of the Vietnam War. For the most part, I was too busy working as a nurse at the Central Virginia Training Center and taking care of our household to even notice any anti-war tensions. However, I could feel that there was something wrong, it was as if something was brewing but I never took a part in it. 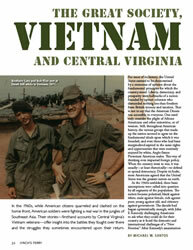 I had been through two wars in my lifetime but nothing prepared for me Vietnam; it was unlike anything else. There just didn’t seem to be a reason to fight, a reason for our sons to be risking their lives everyday. The general public, me included, looked upon the war with disgust. Everything changed when my son, Leslie, was drafted into the army; he was just a boy, only nineteen. He knew that he would be drafted; all the boys that age were going to Vietnam. Still, he looked upon it as an opportunity to serve his country. All along he seemed to have his heart set on entering the navy but due to a heart murmur he could not pass his physical and instead was drafted into the army. Now, from a mother’s point of view, the army should not have taken him anyways, and to this day he is one-hundred percent disabled. We all thought, when he was drafted, that he would not be sent right away. But, after basic training he was sent to Vietnam. Many thought that my views of the war would change, knowing that my son was in hand to hand combat. But, they stayed relatively the same; I was still angry, only now I was scared. Before Leslie was sent to Vietnam, I would try my best not to watch the news because I didn’t think he would have to go. But, after he left all I could focus on were the pictures in the newspapers of the Vietnamese shooting our sons. All the while, never knowing whether that mangled body was the remains of your child. As I look back now, it seems that the media played a crucial role in the war. Not only were the news broadcasts filled with heart wrenching images of dead boys, but they even included body bag counts, everyday. Everything was so confidential that you didn’t know where your son was. They would report battles and numbers of deaths but not who was involved or who had been killed. It caused what seemed like mass confusion, panic; mothers and families not knowing whether after that day’s casualties if their son or brother or husband was still alive. I heard from him often, but it was never the same as having him at home. It was hard reading his letters after they had been read by so many others who had taken black markers to them, censoring his location, censoring basically anything that gave us any detail as to what was happening in Vietnam. I remember that he called us a few times, but never from Vietnam, it always seemed to be from Japan. One of the hardest times in my life was when my son was wounded in Vietnam. As I mentioned earlier, everything was very confidential, we did not know anything. All we received was a telegram, “We regret to inform you that your son has been wounded.” They did not say what kind of wound. For all we knew, he could have been lying on his death bed in some foreign country, when he should have been at home, safe. But, that wasn’t any fault of my own. I tried. I tried hard, to find out where my son was and if he was okay, I even called the Red Cross. It was only after two weeks or so, when we received a letter from the governor telling us that he had only received a slight wound to his arm, where a piece of metal from a hand grenade had impaled him. For a while, he was taken out of combat and sent to hospital in Japan; it was there that he was allowed to phone me, probably about two months after the fact that he had been wounded. After a year, he was sent home. Homecoming for my son, as a Vietnam veteran, was unlike anything I had witnessed. Comparing his arrival to the other two wars that I had lived through, he was not welcomed with open arms. It was as though he, himself, was being punished for our country’s mistake of entering this war. I, however, was not angered by this; I was just happy to have him home. But, I could tell that it bothered him. When he arrived home, he was changed man. He was nervous, paranoid almost. He even had trouble sleeping through the night. And, it seemed that every little thing would set him off; he returned from this war with a temper that I had never known before. And, simply stated, he was never the same again.